There has been a church in Theydon Mount since the Middle Ages, but in 1612 the parish records tell us that there were no services for two years ‘because the Church was so long in being built after it was burned’. The new church, completed in 1614, was dedicated to St Michael, unlike its predecessor which was dedicated to St Michael and St Stephen. Most of the cost was borne by the Smyth family of nearby Hill Hall, and their initials can be seen incised in the brickwork over the entrance door. They used good quality bricks from their own brickfields just up the road, and incorporated some Renaissance decoration into the porch and tower. The chancel, however, was the responsibility of the Rector – not a wealthy man – who could only afford poor quality bricks. The interior is a remarkably complete example of early 17th century work, retaining its original oak pews, panelling and black letter text on the south wall. The Creed and the Lord’s Prayer are somewhat disguised by later memorials – to Sir Robert Hudson of Hill Hall, and to the Great War victims – which have been placed around them. The Ten Commandments over the chancel arch were regrettably painted out by an over-enthusiastic Rector in the 1960s. The roof timbers are original, but they were designed to have a barrel-vault plaster ceiling under them. This was removed in the 1920s, but it can be seen in an old photograph of 1903, as can a 19th century gallery at the west end which was taken down at the same time. 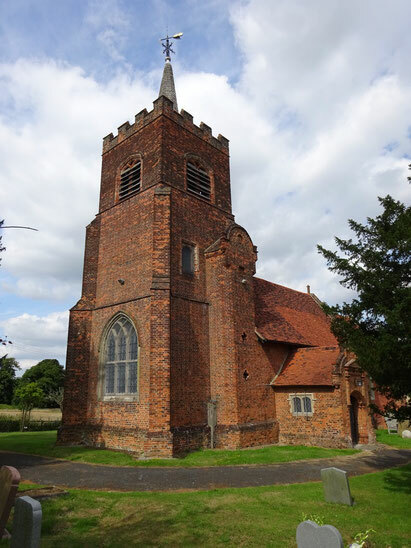 It has sometimes been thought that St Michael’s was a private chapel for Hill Hall, but it has been the only parish church for Theydon Mount since at least the 13th century. 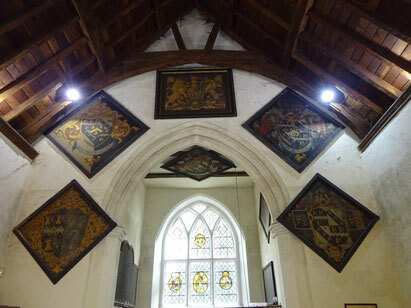 However, the Smyths as lords of the manor certainly treated it as their own, crowding the chancel with life-size effigies and the walls with memorial tablets and funeral hatchments, creating an exceptional collection. To the left of the altar is the alabaster and marble monument to Sir Thomas Smyth, an outstanding Tudor scholar, statesman and builder of Hill Hall. The Latin inscriptions include both praise for Sir Thomas and a curse to anyone who speaks badly of him! 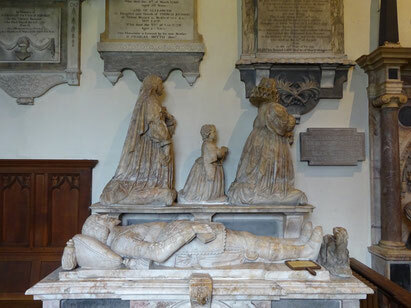 To the right of the altar is an even finer monument to his soldier nephew William, who rebuilt the church, and William’s wife Bridget, with their children arranged as ‘weepers’ below. High up in the chancel is Sir William’s tabard, with a painted shield and (until it was stolen in 2010) a helm, which were probably carried on the coffin at his funeral. The effigy of his son, another William, includes his two wives. 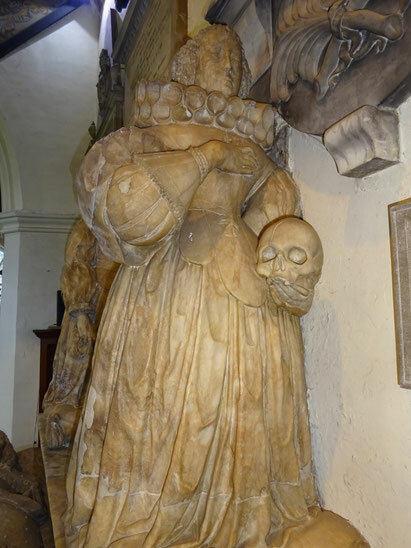 The first wife carries a skull to show that she died before her husband, and the second wife wears widow’s weeds. Until 2010, William’s 4-year-old son Edward knelt between them, but the poor little fellow was also stolen in the same burglary, along with an alabaster salamander, the emblem of the Smyth family. Remarkably these two sculptures were spotted by Christie’s and have now been returned to their rightful places. 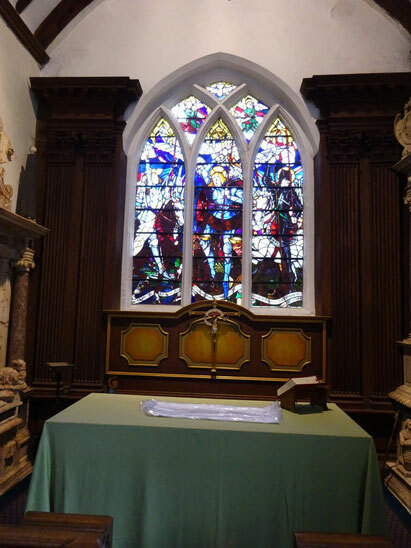 On the opposite side of the chancel is William’s brother Thomas, who died nearly forty years later in 1668. His sculpture reflects the Restoration fashion for lace cuffs and cravat, with a long curly wig. Later Smyths are recorded on wall tablets and the heraldry of funeral hatchments. 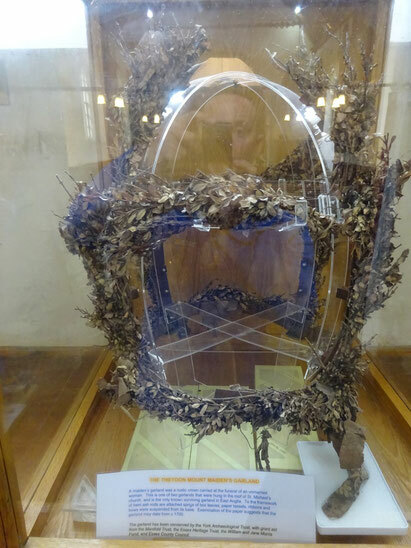 Another more humble funeral item is the ‘Maiden’s Garland’, which originally hung with others from the roof and is now preserved in a glass case. It would have been carried on the coffin of a virtuous maiden who was betrothed but died before marriage. Shaped like a crown, it is decorated with box sprigs, paper tassels and ribbons, and symbolised the wedding which never took place. This garland may be over 300 years old and is the only surviving example in Essex. By the entrance door is a tiny marble font, of unknown but probably continental origin. It resembles a holy water stoup. In the west window (currently removed for restoration) there are pieces of mid-16th century stained glass which originally came from Hill Hall. They include the Smyth emblem, coat of arms and initials. In the east window is a striking example of stained glass from the 20th century. Designed by the artist Wilfrid de Glehn, close friend of John Singer Sargent, it is an allegory of the First World War. St Michael, dedicatee of the church, is in the centre above a dragon. On the right is St George, also slaying a dragon, and on the left is Joan of Arc, their intertwined banners symbolising England and France uniting to defeat the forces of evil. The figures in the background are wearing the uniforms of English and French First World War soldiers, and those crushed under St Joan’s horse are German. The window is in memory of Charles Hunter, who lived at Hill Hall from 1908 until his death in 1916. 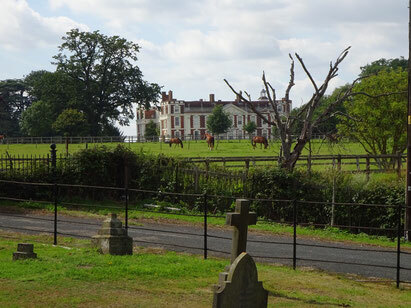 From the churchyard, Hill Hall mansion can be seen standing at a distance. Its former dominance may explain why, from the outside, St Michael’s is of modest size and appearance, yet inside are unusual items of national importance.